Is Trump About To Hammer The Federal Reserve? Back in October of 2015 I wrote a post titled De-Fang the Federal Reserve – The Conspiracy on How the Fed is Being Integrated into the Multilateral Framework. It served as a summary of how the Fed acted as the global central bank almost from its inception in 1913 and how this would change in the lead up to a multilateral monetary framework. The Trump mandate on “America First” is being misconstrued as an isolationist policy but is in fact the cover for integrating America into the emerging multilateral. This is difficult to see for most because it is hard to reconcile the idea of an isolationist mandate with that of a multilateral mandate. It appears to most that America is dumping the globalist script when in fact the script is in fact the same only the characters and events have changed. The theme remains the same. This is one of the main reasons why the media is in fact pushing this isolationist script. It prevents Americans from accurately deciphering the shift towards the multilateral. The opposition to the Federal Reserve and the establishment was built up through alternative media to the point where the masses are now clamoring for the changes which in fact were always required in order to make the multilateral transition. The most obvious point is a changing role for the Federal Reserve. In a multilateral world it will no longer be required to serve the function as an international central bank providing access to a reserve asset. The Fed will be transformed to focus on domestic concerns while the international mandates begin to transition to an institution like the International Monetary Fund and the SDR asset. How Long Can China's Debt Continue To Grow Before A Systemic Crisis Strikes? Nearly three years ago, Morgan Stanley may have jumped the shark (a little) when its strategists Cyril Moulle-Berteaux and Sergei Parmenov declared that China's Minsky Moment has arrived. While that may have been partially true, the fact that China managed to incur an additional $12 trillion in total debt in the interim period, suggests that Beijing at least managed to postpone the inevitable. And since in the 3 years since little has changed, questions about how much longer the Chinese debt-fueled growth "farce" can continue have once again emerged, in their latest incarnation courtesy of UBS, whose economist Tao Wang asks "How long can debt continue to grow before a Minsky moment or systemic debt crisis?" China's debt is set to rise further in the coming years, likely exceeding 300% of GDP within 2 years. As the government continues to rely on credit-fuelled investment growth to offset downward pressures within the domestic economy and from a subdued global environment, unless there is major debt restructuring, China's debt/GDP ratio is set to rise further. We don't think that there is a "magic" level at which a debt crisis will take place. Many countries ran into debt crises at levels of debt significantly lower than China's current level, often because debt was financed by foreign resources due to low domestic savings, and/or because of duration mismatch (Figure 11). Conversely, there are countries (e.g. Japan, Figure 2) where debt levels have risen ever higher without triggering any obvious financial sector distress. For months/years we've covered the many real estate bubbles that have been inflating all over the world courtesy of Chinese billionaires looking to launder money offshore (here are just a couple of examples: Vancouver, Sydney and New York). But a new set of capital controls enacted in China on January 1st, and aimed specifically at curbing foreign real estate investments, may just be the needle that finally pops all those bubbles. As Bloomberg pointed out earlier this month, the following new restrictions on foreign currency transaction were implemented earlier this year. And while some of the new capital controls above may not seem that onerous, they're already threatening real estate deals from London to Melbourne as Chinese buyers are finding it increasingly difficult to fund down payments. The day the Dow crosses 20,000 may finally be here, because with DJIA futures trading 65 points higher in premarket trading, added to yesterday's close of 19,912 and latest record high in the S&P, it means that all it will take is a modest of only 25 points for the critical Dow threshold to be finally breached. Celebrating the upcoming record, world stocks hit a 19-month high on Wednesday, lifted by strong Japanese trade data, strong European company earnings and hopes that U.S. President Donald Trump will press ahead with a large fiscal spending package. In short: the Trumpflation rally is back with a bang (even if the dollar is not particularly enjoying it, although the decoupling between the USD and rates was duly noted yesterday so it isn't too surprising). "U.S. stocks have shown renewed signs of life this week, as the market toyed with the idea of reigniting the 'Trump rally' that we saw in the aftermath of the presidential election," said Kathleen Brooks, research director at City Index. "Wednesday's key theme is the return of the 'Trump trade'," Brooks said. In early trading, European equities extended the global rally as corporate earnings reignited investors’ optimism in economic growth with construction companies outperforming on expectations Trump will announce the "massive" Mexican wall. The MSCI All-Country World Index rose to 433.6, up 02%, to its highest level since June 2015 as equity markets from Tokyo to London climbed after the S&P 500 Index closed at a record. BHP Billiton Ltd. paced gains in resources shares and iron ore extended a rally. A surge in industrial metals bolstered raw-materials companies, while gold declined for a second day. The yen edged higher after sliding Tuesday. The Aussie fell after weaker-than-expected inflation data, while oil retreated after a four-day advance. 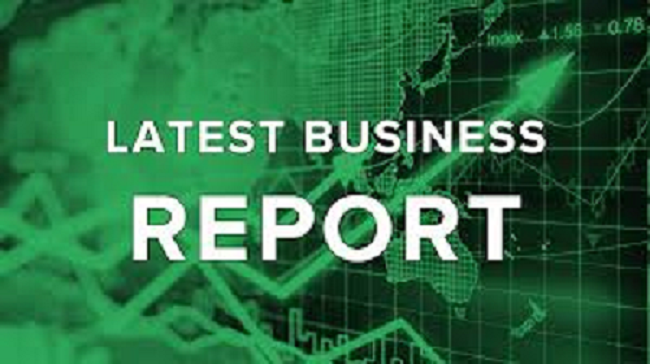 Europe's index of 300 leading shares and Germany's DAX both rose 1 percent and Britain's FTSE 100 was up 0.7 percent. Spanish bank Santander was among the big gainers in Europe, its 4 percent rise in 2016 net profit giving its share price a similar boost and leading the continent-wide rally in bank stocks, despite some disappointing data out of the German IFO survey which missed on both expectations and conditions. When Trump said the administration “just officially terminated TPP,” it prompted applause from the labor chiefs (and this time it certainly wasn't by paid members of the studio audience), who later described their meeting with Trump as "incredible." Amid a weakening yuan and a tumbling Bitcoin (amid crackdowns on 'virtual' capital outflows from China), Chinese money is moving to bullion as investors seek an alternative to the 'managed' fiat paper offered by the PBOC. In the week through Monday, China attracted $52 million, the biggest inflow into commodity-linked exchange-traded funds of all countries tracked by Bloomberg. As Bloomberg reports, Huaan Yifu Gold ETF, China’s largest ETF backed by raw materials, is getting all the attention, attracting almost $72 million last week. Heading into the Chinese Lunar New Year, local banks are suddenly starved for liquidity like never before. On Tuesday China’s benchmark money-market rate jumped the most in two years, with unprecedented cash injections by the central bank being overwhelmed by demand before the Lunar New Year holidays. Demand for cash in China tends to increase before the Lunar New Year holidays, when households withdraw money to pay for gifts and get-togethers. Month-end corporate tax payments are adding to the pressure this time, with the break running from Jan. 27 through Feb. 2. At that point the PBOC usually steps in with liquidity "injections" in the form of reverse repos. However, what it has done this year is literally off the charts. On Wednesday, the People’s Bank of China put in a net 410 billion yuan ($60 billion) through open-market operations, the biggest daily "injection" on record. Despite this massive boost in liquidity, the interbank seven-day repurchase rate still jumped 35 basis points, the most since December 2014, to 2.76 percent, according to weighted average prices. Yesterday, the overnight repo rate rose 10 basis points to 2.50 percent, the highest since April 2015, according to weighted average prices. So, with liquidity still scarce, moments ago on Thursday morning, the PBOC added another net injection of 190 billion consisting of 100Bn in 7-day repo and 150BN in 28-day repos, offset by 60bn yuan in previous loans maturing. As a result, the PBOC has injected a net of 1.035 trillion yuan via reverse repos so far this week, an all time high. In general, most people would agree that the housing collapse of 2008/2009 was a negative event in U.S. history. A combination of misinformed regulations from Washington D.C., low interest rates, poor underwriting standards that allowed for, among other things, the idiotic "cash out" mortgage, and an insatiable demand for securitizations drove one of the biggest asset bubbles in history which almost brought down the entire global financial system. But, at least one person, namely New York Fed President Bill Dudley, thinks that a repeat of the 2008 mortgage crisis is exactly the cure for America's stagnant retail sales. Speaking at the National Retail Federation's annual convention in New York, which was undoubtedly full of perplexed retailers wondering why their store traffic remained so weak amid Obama's stunning "economic recovery", Dudley intimated that the cure for weak retail sales was a return to 2006 practices in which debt thirsty Americans repeatedly withdrew every dollar of equity in their homes to fund their trips to the mall. “The good news is that, while the current expansion is quite old in chronological terms, it is still relatively young in terms of the health of household finances,” Dudley said in a speech to the National Retail Federation. “Whatever the timing, a return to a reasonable pattern of home equity extraction would be a positive development for retailers, and would provide a boost to economic growth,” Dudley said. Homeowners may have overlearned the lessons from the housing boom and bust, the New York Fed President said. Even though home values have risen over 40% since 2012, housing debt has stayed virtually flat, he said. “The previous behavior of using housing debt to finance other kinds of consumption seems to have completely disappeared,” and people are leaving the wealth generated by rising home prices “locked up” in their homes, he said. The United States is a demographic time bomb, plain and simple. Over the next 30 years, the U.S. economy will face an unrelenting demographic transition as ~75 million baby boomers exit the highest wage earning years of their life and start to draw down what little retirement savings they've managed to tuck away while wreaking havoc to the public "safety net" ponzi schemes, like Social Security, that will almost certainly be insolvent in a decade. Per the U.S. Census Bureau, over the 30 years, the number of people in the U.S. over the age of 65 is expected to double while those 85 and up will triple. Needless to day, the overall population growth of the United States is a fraction of that which means that millennials are about to get crushed by their parents....so it's probably a good thing they already live in mom and dad's basement. In aggregate, per the Wall Street Journal, Boomers have saved $10 trillion in various tax-deferred saving accounts. While that sounds like an impressive figure, with 75 million Boomers, it equates to an average of $133,000 per person which, needless to say, is insufficient to fund ~20 years of retirement. But while the Boomers, and by extension taxpayers, are facing a harsh future, Wall Street has made a killing in fees off of managing the ever growing balance of retirement accounts as Baby Boomers have come of age. But that all looks set to change as America's aging population is forced by IRS regulations to take retirement withdrawals once they hit 70 1/2 years of age. As illustrated by the chart below, over the past 2 decades Americans have consistently contributed more than they've withdrawn from tax deferred accounts, excluding recessionary periods. But that all changed in 2013 and 2014 as the first wave of Boomers hit the magical age of 70.5 with a total of $25 billion of net withdrawals in 2014 alone. What is driving the US stock markets to such amazing gains? While some corporations have seen increases in sales and most have innovated to reduce costs, lessen waste, and maximize efficiency, I'll focus on some of the other means that have driven profits higher helping to push US equities into record territory. 1- Declining % of profits going to Uncle Sam. 2- Minimal wage growth and holding the line on new hires. 3- Debt fueled stock buybacks and dividends at the expense of investment in mid and long term activities (R&D, cap-ex, exploration, etc.). 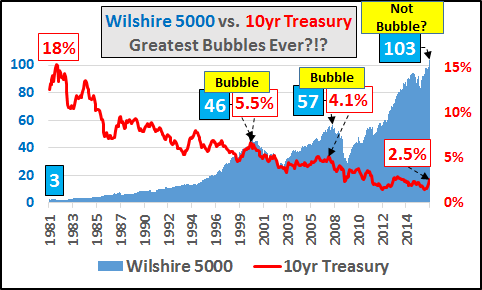 To represent the US market as broadly as possible, we'll use the Wilshire 5000 index, representing all 3600+ publicly traded US corporations (chart below vs. the 10yr Treasury rate). Celery and raspberry? Marathon miles of Sudoku and crossword puzzles? Extra reps at the gym? Binge away. ‘Tis the season after the season, that other most wonderful time of the year when it’s a challenge to get a machine at the gym and resolutions are resolute, at least until February or a more intriguing deal comes along. What better way to make amends for that huge holiday hangover that crescendos with so many a New Year’s Eve bash? Some of us chose to ring in 2017 in a substantially more subdued manner that nevertheless entailed binging of a decidedly different derivation. Enter Netflix. Yours truly must confess that closet claustrophobia was the culprit in keeping this one indoors coveting the control, confining the choices to richly royal romps. It all started innocently enough, with a recommendation to catch The Crown, which has just won a Golden Globe. The devolution that followed began in Italy, with Medici, stopped over in France, with Versailles, and round tripped back to England, with the epic saga that kicked off the modern day, small screen genre, The Tudors. At some point hallucinations began to give the impression that all the series’ stars had British accents. Wait, they actually did. Thankfully, at some point, bowl games snapped the spell and reality rudely reared its redemptive head before anyone’s else’s head rolled (those royals were a bloodthirsty lot!). Sleep and sanity followed. Sadly, the same cannot be said of borrowers of almost every stripe these days. For those tapping the fixed income markets, the borrowing binge fest is conspicuous in its constancy. Not only did global bond issuance top $6.6 trillion last year, a fresh record, sales are off to a galloping start thus far in January. The world was reminded of the cozy relationship between The Fed and The Treasury again today as Janet sent Jack $92.0 billion of freshly ponzi'd net income for 2016 providing the federal government with an important source of funding. This, however, is down almost 6% from 2015 and despite a considerably larger balance sheet is the lowest remittance since 2013 due to doubling the handouts to the major banks to $12 billion last year. Between more cautious lending and weak economic growth, total reserves have been at historically high levels since the financial crisis -- roughly $2 trillion as of the end of the last year compared with a few billions of dollars in more typical times. When the Fed increased its target interest rate in Dec. 2015 by a quarter of a percentage point, to a range of between 0.25 and 0.5, it increased the rate paid to banks as well - and pushed its overall reserve interest costs from $6.9 billion in 2015 to $12 billion last year. Moderna Therapeutics, based in Cambridge, Mass., has raised $1.9 billion at a valuation approaching $5 billion–higher than most publicly traded biotechnology companies. But the company is so secretive that until now the company didn’t even disclose what most of the drugs and vaccines it is developing are meant to do. Today, at the J.P. Morgan Healthcare Conference in San Francisco, Moderna is unveiling new details about its pipeline and strategy. The company now has five vaccines in clinical trials. Two are for strains of influenza that could become pandemic, for which governments might want to stockpile vaccines. Another is for Zika virus, and a fourth, being developed with AstraZeneca, would treat heart attacks disease. The goal of a fifth, being developed with Merck, is not being revealed. Another vaccine, for Chikungunya virus, a mosquito-transmitted disease, is ready to start trials. The flu vaccines are an interesting strategic gambit. Neither is likely to become a product, although governments may want to stockpile them, according to Stéphane Bancel, Moderna’s chief executive officer and a 10% stockholder in the company. But they provide an early chance to prove that Moderna’s basic technology works. The Era Of Cheap Money Is Ending: "This Is The Calm Before The Storm"
We’re living in the calm before the storm. That much everyone can sense. The stock market highs and holiday spending spree will soon be over, the inauguration will presumably go as planned, but that’s when everything could start to go off course. The only question is how the storm is going to stir into a frenzy – there will be a pretext of some kind. What seems certain is that it is past time to get ready for a difficult period. This could be the big, slow squeeze and the long winter. The economy became immune to stimulus and quantitative easing; the market can only be propped up so long, and the realities of raised interest rates a matter of timing for the Fed to decide. Now, President-elect Trump provides the catalyst necessary for a dramatic rise and fall in the economy. With the force of the economic avalanche that is poised to fall upon us all, the policies and actions of President Trump will do little to stem the tide of what is already coming; for better or worse, there is little that Trump himself can do even though it may fall squarely on his administration. There are many putting out the talking points now; the warnings are reaching a crescendo. Bitcoin is no stranger to extreme fluctuations. As Visual Capitalist's Jeff Desjardins notes, for each of the last four years, the cryptocurrency has either been the best or the worst performing currency – with nothing to be found in between. Earlier today, we were surprised to note that having aggressively drained liquidity from the interbank funding market, on the first trading day of 2017, the PBOC not only fixed the Yuan well lower (sy 6.9498 vs 6.9370 on the last day of 2016, even if this was well stronger than the Offshore Yuan), but the People's Bank of China withdrew even more liquidity. It did that by injecting CNY20 billion via 7-day reverse repos and another CNY20 billion via 14-day reverse repos in its open-market operations Tuesday, according to traders, while continuing to skip 28-day reverse repos. 2016 was a year most hedge funds would be happy to forget. And while the same goes for 2015, 2014, 2013, 2012, 2011, and 2010, in fact virtually every year since the financial crisis in which the vast majority of the two and twenty crowd have failed to generate alpha, in 2016 - a year many said would mark a renaissance for active managers - the "flash hedge fund return" according to a report by BofA's Paul Ciana from Friday was a paltry 3.34%, which as BofA conveniently calculated meant they "underperforming the S&P 500 index by 6.2%" at which point your average underperforming hedge fund manager complains that they shouldn't be benchmarked against the S&P, even as the redemption notices flood in and the AUM gets ever smaller. In recent weeks there has been a fresh burst of hope that 2017 will be better for the HF community as a result of the recent collapse in cross-asset correlation; it is hoped that the resulting returns dispersion will make it easier for hedge funds to stand out in a world in which due to central bank intervention, correlations had been abnormally high following the financial crisis. But is that an accurate description of events? To a great extent, the answer is no. While correlation between diversified HF performance and S&P 500 price return declined from the May 2016 high (Chart 1), the 1-year correlation (83.7%) was slightly above the 3-year correlation (83.0%) as of the end of November. Overall, correlation remained far higher than it has been historically. Which as BofA redundantly explains, means that "when S&P 500 declines, performance of HFs with higher positive correlation is expected to suffer."